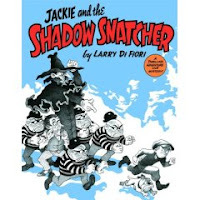 Jackie and the Shadow Snatcher by Larry DiFiori. Copy supplied by Knopf Books for Young Readers. The Plot: Jackie is the type of kid who would lose his head if it wasn't attached. So it' s no surprise when he loses his shadow. But it turns out it's not only lost; it's been taken by the Shadow Snatcher, who takes shadows, sews them together, and uses them to hide his criminal activity. Can Jackie get his shadow back? The Good: Adventure and mystery and a little bit spooky. Jackie's clothes place him in the 1920s or 1930s; and this has the look and feel of a movie from back then. There's even a spooky old house, boats, and a chase scene. I like that Jackie is a regular kid; he loses things, he messes up, he tries to fix things. The humor is also good; once Jackie learns that his shadow has been snatched, he wonders, "Shadow Snatcher! Why don't they tell us about this sort of stuff in school?" Why not, indeed. The graphic novels I'd been reading recently for the under 12 crowd have been targeted at girls; Jackie has boy appeal. (Tho let me say Babymouse also has boy appeal -- my godson, who is Mr Rough and Tumble and loves sports, also loves Babymouse. Yeah, we shouldn't label books, but we do.) It'll be nice to be able to give this to the younger crowd who come in looking for graphic novels. Big A little a review.